Year after year, one of the top findings – and challenges – identified in our annual content marketing research is that marketers want to create content that is more engaging. It’s a top priority for any marketer no matter how effective or how big the company. One way to engage: Surprise your audience. Dave started the conversation by sharing something ShurTech does that usually delights customers. They have someone whose sole responsibility is influencer marketing, and she often has one-to-one conversations with those using the products (think: Duck Brand® duct tape). She picks up the phone and talks to people who are using the product. They’re the people that know the most about it — the power bloggers, your brand advocates, just the average YouTuber who makes a duct-tape craft. It’s incredibly powerful to reach out to them directly because they don’t expect it. It’s not something that brands do a lot. Andrew shared a similar example. The CEO and president of a high-end consumer brand called two customers a day: One in the morning and one at the end of the day. It’s the most shocking calls. They used to slot 30 minutes for these calls, expecting people to chat, but the people are like, ‘What? I didn’t expect you to call. This is crazy. Let me tell my wife.’ I think it’s something more brands could do. We are talking about content marketing, but I think there is a lot you can learn from those personal interactions, all the way up the chain, that end up being great stories on their end and really insightful research on the brand end. Consider: What can you or someone on your team do to delight an influencer or customer? Make a call? Send a personal note? Even though this does not directly impact the content you create, it impacts your audience’s experience with the brand – and someone who is delighted personally is more apt to read and share your content. Among the most surprising content marketing and even surprising event-based marketing are the consumer brands that show up where you don’t expect them. Andrew was at a video game convention, and all of a sudden, Rohto eye drops was there. What a clever way to get your product – and content – in front of the right audience in a way that no one would expect. 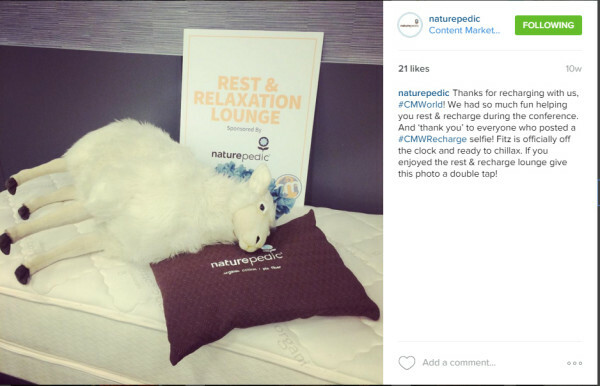 As another example, just down the hall from this roundtable at Content Marketing World, Naturepedic hosted a relaxation room, complete with its mattresses, fluffy robes, and tea. Consider: What opportunities do you have to put your content in front of a related audience who may not be expecting it, but would get a lot of value from it? Consider: Whatever you decide to do, remember that one-off surprising experiences are only the first step. How can you continue to delight your audience? What can you do to continue the conversation with the influencers you reached? The more effective content marketing isn’t just about doing whatever you think everybody else is doing. It’s about experimenting and really understanding what your audience needs and finding the right things to do in unexpected ways. What can you do that is unexpected? How will you delight your audience? Share other examples of content and experiences that have delighted you.